When you spend the time to precisely measure and mix, you want the end result to not only taste good, but look good too. 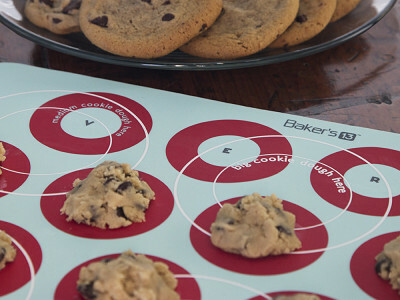 Baker's 13 Ultimate Baking Mats turn out perfectly-shaped cookies every time. 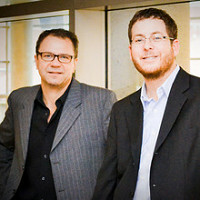 Founders Jon Lindholm and Brian Clemens set out to make baking easier and less costly. Their bright, whimsically designed mats are made with the highest quality, FDA approved, food-grade silicone. And unlike other silicone mats, Ultimate Baking Mats have medium and large cookie dough target circles for evenly spaced and uniformly shaped cookies that slide right off when ready. No nonstick sprays or parchment paper are necessary. As for cleanup, the mats are dishwasher safe, but also can be washed easily with a quick swipe of a soapy sponge. Ultimate Baking Mats aren't just for cookies. Sweet or savory, if a recipe calls for a baking sheet, these no-stick mats are an ingredient for success. You can even cut them down to size to line smaller pans or toaster ovens. When you spend the time to precisely measure and mix, you want the end result to not only taste good, but look good too. 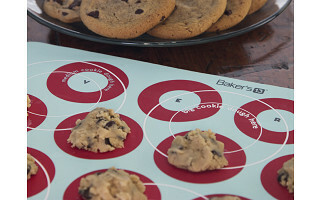 Baker's 13 Ultimate Baking Mats turn out perfectly-shaped cookies every time. Founders Jon Lindholm and Brian Clemens set out to make baking easier and less costly. Their bright, whimsically designed mats are made with the highest quality, FDA approved, food-grade silicone. And unlike other silicone mats, Ultimate Baking Mats have medium and large cookie dough target circles for evenly spaced and uniformly shaped cookies that slide right off when ready. No nonstick sprays or parchment paper are necessary. As for cleanup, the mats are dishwasher safe, but also can be washed easily with a quick swipe of a soapy sponge.